The Junior League of San Jose, Inc. is a nonprofit organization of almost 800 women committed to promoting voluntarism, developing the potential of women, and to improving the community through the effective action and leadership of trained volunteers. Our purpose is exclusively educational and charitable. The Junior League of San Jose reaches out to women of all races, religions and national origins who demonstrate an interest in and commitment to voluntarism. 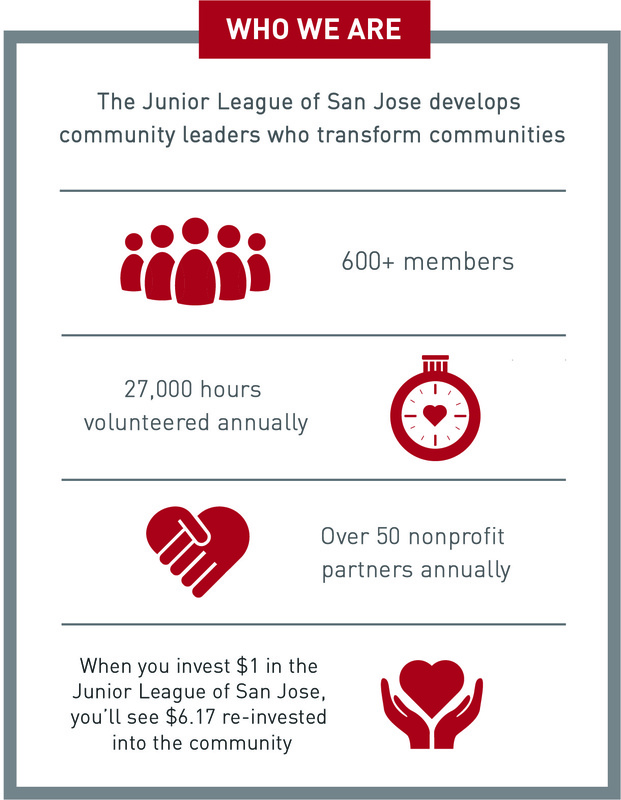 The Junior League of San Jose is one of 292 Junior Leagues in the Association of Junior Leagues International (AJLI). The Junior League of San Jose develops projects after careful consideration and research of an unmet community need that falls within the emphasis area of training youth and families in life, career and service skills. Each project provides initial and ongoing training to the members as well as high-quality service to its clients. Administrative guidance given by a League liaison who serves on the collaborating agency’s Board of Directors or local governing board in a position created for the duration of the project. She shares her acquired volunteer skills, expertise and League philosophy. This facilitates a shared responsibility for the successful administration of the project. After working collaboratively with local nonprofit organizations to achieve specific goals and objectives a League project is then turned over to the community agency or group best suited to maintain it. The Junior League of San Jose is currently involved with two signature community projects. Since 1967, the Junior League of San Jose has played an integral part in the development, improvement and support of Santa Clara County. Below is a partial list of some of the past projects. Short term League assistance is available through the Done-in-a-Day Committee (DIAD). Done-in-a-Day is a service that responds to community needs by conducting impactful hands-on projects, in partnership with community agencies, that fit within the Junior League of San Jose’s mission and emphasis statements. Done-in-a-Day projects typically provide six to twenty volunteers, limited funding, and are delivered over an average of two to 12 hours. The Junior League of San Jose sponsors the annual Volunteer Recognition Luncheon (VRL) to promote voluntarism in the community and to celebrate the spirit demonstrated by those individuals who have given their time and skills to help others. The luncheon is held annually during National Volunteer Week. Financial aid is made available to nonprofit organizations for the co-sponsoring of a one-time event or product or collaborating in research into identified problems or needs (Co-Sponsorship / Collaboration Fund), or an immediate community emergency crisis such as a natural disaster (Emergency Response Fund). Through the Together Reaching Out fund, the Junior League of San Jose provides financial assistant to past projects. Current partners include CompassPoint Nonprofit Services, the Volunteer Exchange, and InnVision / Georgia Travis Center.